In telecommunications, 4G is the fourth generation of mobile phone mobile communication technology standards. It is a successor of third generation (3G) standards. 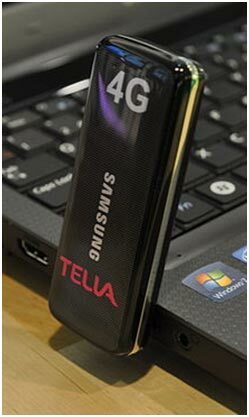 A 4G system provides mobile ultra-broadband internet access, for example to laptops with USB wireless modems, to smart phones, and to other mobile devices. Conceivable applications include amended mobile web access,IP telephony,gaming services ,high-definition mobile,TV,video conferencing,3D television and cloud computing. In march 2008,the international Telecommunication Union-Radio communications sector(ITU-R)specified a set of requirement for 4G standards, named the International Mobile Telecommunications Advanced(IMT-Advanced)specification, setting peak speed requirements for 4G service at 100 megabits per second(Mbit/s)for high mobility communication and 1 gigabit per second(Gbit/s) for low mobility communication. As opposed to earlier generations, a 4G system does not support traditional circuit-switched telephony service, but all Internet Protocol (IP) based communication such as IP telephony. As seen below, the spread spectrum radio technology is used in 3G systems, is abandoned in all 4G candidate systems and replaced by OFDMA multicarrier transmission and other frequency-domain equalization (FDE) schemes,making it possible to transfer very high bit rates despite extensive multi-path radio propagation(echoes).The peak bit rate is further improved by smart antenna arrays for multiple-output(MIMO) communications. The pre-4G 3GPP Long Term Evolution (LTE) technology is often branded"4G-LTE",but the first LTE release does not fully comply with the IMT-Advanced requirements.LTE has a theoretical net bit rate capacity of up to 100 Mbit/s in the downlink and 50 Mbit/s in the uplink if a 20 MHZ channel is used and more multiple-input multiple-output(MIMO),i.e. antenna arrays, are used. The physical radio interface was at an early stage named High Speed OFDPackets(HSOPA),now named Evolved UMTS Terrestrial Radio Access(E-UTRA).The first LTE USB dongles do not support any other radio interface.